[colour=#000000]Applejack punched the stake into the ground, giving the final stable anchor to one of tents she had put up for camping, here in the middle of Galloping Glade. 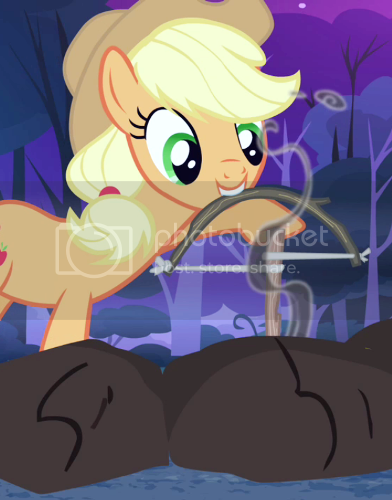 The glade was a bit ironic for Applejack. A mare who spent her entire life working around trees, would find comfort and serenity in a clearing of anything but trees. Nonetheless, this spot was one of the family's favorite spots to camp out at, a large yard perfect for grazing and surrounded by trees, a rolling hill that wasn't too steep, and a generous-sized pond in the middle of it all for swimming, decorated with the cattails and long grass along the muddy perimeter of the body of water. It was this location that today they would share it with Carrot Fields and his little sister Purple Haze. As the two family's togetherness continued, individual relationships also seemed to push forward. Purple and Apple Bloom seemed to be getting really close as friends, despite Purple already having her cutie mark, Big Macintosh seemed to like to have the company of Carrot, for finally another stallion involved in the Ponyville farming business had some sort of input instead of the red stallion always being alone in a see of mares. Carrot Fields was feeling a bit flustered. Not like he hadn't been on camping trips before - but not with a cute filly like Applejack, who he wasn't related to. And Purple Haze, his nosy, interfering little sister, had put him into the same tent as Applejack, so that Apple Bloom could share the carrot tent with Purple Haze! And everypony had gone ahead and agreed with it! He'd never taken so long to put up a tent - and with Purple Haze sitting there and getting frustrated with the delays. The canvas kept slumping, and the tent poles kept popping out of - OOP! There was another one! He darted forward and grabbed the tent post with his teeth, giving it a strong tug to keep it from collapsing the tent once again, his teeth gritted as he hauled it out and started setting it firmly into the ground. Macintosh had been on hoof to help out with tents, but it seemed everypony was far more content to do their own - a fact that didn't irk Mac at all, since he understood that each of the ponies had their own idea on how to do stuff, and that it wasn't needed for him to be at the forefront to lend a hoof. On account of this, the red stallion had taken something of a backseat for a l'il while as he set up his own tent and had been making sure that any and all of his own neccessities were all up and where they needed to be...nopony wanted to be unprepared during a campout like this, and Macintosh was certainly no exception to this particular rule. A particular train of thought that he was occasionally flicking attention back to was Applejacks rather interestingly developing friendship with Carrot - a pony whom seemed to be hard working, if a little bit clumsy and nervous...although something told Mac that this was possibly an influenced behavioural trait that had been brought to the table from Applejack herself rather than any fault of her own. Seeing that the pair of them clearly wanted to spend a little more time getting to know each other, mac had suggested the campout during their visit a little while ago, and his suggestion had taken something along the lines of fruition...now whether or not his l'il gambit would pay off in respects for either of them friendship-wise would remain to be seen, but the Red stallion was confident in his sisters ability to perhaps keep things open and friendly. Plus, he figured it'd be a good idea to perhaps see if him and carrot could establish a friendship of their own. Afterall, when it came to farming, it always paid to have a few allies in the field...just in case you needed them! Right now he was a little restless...as such, he simply decided to see if Applejack had anything planned for tonight. Sure, he could have assisted in the tent-reparations with Carrot, but with Purple having called upon Applebloom for help, he didn't want to prevent the l'il Apple from proving she could be useful without any external assistance. She would already know that if she needed any help, - well, he'd be around for that...that is, if she didn't let herself get carried away. Galloping Glade was one of Apple Bloom's favorite camping spots in all of the Whitetail. It had the perfect combination of underlying safety yet rustic charm and wild woods activities that filled a filly with the spirit of adventure in the grandest way possible. You always knew you were safe, but in those little moments of imagination, a camping trip became an adventure with the unknown nipping at your tail feverishly. What would you see? What would you do? The options were limitless. A hard day's hike never felt so refreshing as when you made camp cresting a hill, looking down behind you at a valley that you had just sauntered on through. A fire was never warmer than when you found the firewood yourself and basked in the lonely glow of light in a dark night. Thrills and chills were never more pronounced than when an able ghost story was told with the woods and all their unknown qualities adding verve to the tale, laughter never louder than in the expanse of both open land and the warmth of the collected hearts. Fueled by excitement, sustained by energy, Apple Bloom knew the source of the joy despite all this was the love and care that campers shared for one another. She had went camping with Applejack more times than she could count, each time more fulfilling and loving than the last. Big Mac didn't come as often, but the times she shared with her big brother were treasured immensely. The fact he was actually here was a blessing that she hadn't counted on, and such things were treasured- you never looked a gift stallion in the mouth, after all. Especially when he was the size of the mountain. Her Crusader friends had come before and Apple Bloom could scarcely recall having more fun with them. Now, Carrot Fields and Purple Haze were joining them, and a new bond was to be forged in the Glades this weekend. No work, no worries, no housework or farm work, nothing to distract them from being simply, and wonderfully, pony. It was going to make them stronger, closer, and Apple Bloom couldn't think of anybody she'd rather get to know better than the stallion with the funny accent and the filly with the culinary skills of a flamethrower on high on a summer's day should Celestia go made and bring the sun down on Equestria. Filly could cook, though. On this trip, she and Purple Haze were going to share a tent while the older ponies shared one. It had become apparent why Purple had proposed this, and Apple Bloom had giggled for a few minutes in private when she realized why. Everypony who wasn't a few kernels short of a cob knew that Carrot had the pitter patter of his heart pumping out little miniature floating hearts for Applejack. It was quite adorable and very charming, especially since Applejack sorta kinda knew what was going on but didn't seem to have a firm grasp of what it meant. Applejack was a pony of many talents but she was found lacking this area. Poor Carrot, Apple Bloom thought as the tent was finished. Stallion would be driven to madness and then some in the sweetest way possible tonight while the two fillies chortled and chased some junebugs around. Applejack went off to go offer her services, and Carrot's shocking inattention to his own tent as a result caused most of it too either collapse or start to look like some mutated evil tent from the Everfree. But he quickly distracted by mentioning telescopes, and Apple Bloom wondered if he also had a crush on Twilight Sparkle. With all their star speak and charts and fondness for oversized binoculars, they'd go together like peanut butter and jelly. [colour=#ff0000]"But Ah reckon that Carrot here needs help pitchin' his tent, 'fore we start to go gallopin' all across these glades," [/colour]Apple Bloom replied affirmatively, galloping past the stallion until she was with her friend. Now was the time that friendships were formed- under duress because the big ponies were being dunderheads. Carrot Fields was so embarrassed at his little sister's scolding - not that he'd admit that to her! Besides, she was right - after all the training he had in the REA, he should have had his tent pitched in two minutes, easy! Still, at least he could get his telescope set up, there was no way he could screw that up. Carrot's heart lifted as Applejack expressed interest in it ... for her little sister. His heart sank again. Then lifted again when she expressed her own interest. Sort-of. Well, he was sure the glory of the skies would convince anypony! He went to get a basket, ready to gather firewood. [colour=#ff8c00]"Happy tae help! "[/colour] he exclaimed, flipping the basket onto his back - usually an easy catch, but it bounced off his backside, tumbling through the dirt. [colour=#ff8c00]"ER... oops! ah got thes! "[/colour] he said, scrambling after it. He got it - on the third try. Why was he being such a klutz?! Purple Haze groaned softly. It sounded like everypony was going to be as obsessed about the stars as Carrot was! She didn't know how many times he'd dragged her out to the stargazing hill so he could point at one star after another and just recite all sorts of facts that she was half-convinced he was just making up on the spot. How different could they be?! They all looked exactly the same to Purple! Macintosh looks over at Applejack and gave a small nod - the box of treats was currently located in a bag in his tend, and thus he headed off back that way to obtain them, taking a brief moment to watch as Applebloom started to make her assistance with purple haze. It was kinda adorable to watch the filly's do what they could like they were, and whilst he figured that perhaps he may have to double check what they might finish doing, there was probably no immediate danger in letting them do what they were...afterall, they WERE kinda in the presence of adults close enough by that there probably wasn't much danger of anything going awry. A few moments after, and once he had rummaged through his own bags and triumphantly found the one box...bringing it over towards the fire pit and ensuring that there wasn't any likely way anything untoward would happen to them if left unattended. Watching the chaotic mess of a tent construction, the stallion of the apples laughed slightly, enjoying what appeared to be comedy in motion - it was early enough in the day and the weather was seemingly on their side, so it wasn't yet a complete issue...and once they were done with their hijinks, Mac decided that he would then offer his assistance, preferring to let the filly's expend a little energy first. All in all, he felt quite a positive energy surrounding this l'il excursion, and he looked forward to seeing just how the two families would get along in such an environment as this! She hadn't really been able to spend all that much time with Purple since they had first met, but she was looking forward to the camping trip for that more than anything else! She didn't get to see too many new fillies anymore, especially ones with pretty funny accents. That and you never got to know somepony until you were close by under the stars away from the night lights of civilization, only Luna's moon and the twinkling of distant stars to light the way to whatever wonderful adventures you'd play out in the dreams. Nice marshmallow treats, hiking about and talking about whatever fancied you, these were the things that began a real bond. But before she could do that, Apple Bloom would have to help set this tent up! [colour=#ff0000]"Sounds good ta me,"[/colour] Apple Bloom said before launching herself into position and stomping down the first stake with aggression, but not too much that it went too far in the ground. You didn't want to create a divot with your hooves and ruin the foundation of the tent, after all. And Purple started talking- sweet Celestia, that accent would take a long time to get used to, but jeez louise was it infectiously entertaining. She had always wanted to travel Equestria and learn all sorts of languages and hear all sorts of crazy accents, but she figured this was as close to being in Fet Loch as she was liable to get. She asked if an apple orchard was all that much work. Apple Bloom would have been more upset, but that accent! Celestia that accent! [colour=#ff0000]"An Apple Orchard's plenty o' work, Purple! Ya gotta harvest tha apples, inspect 'em, categorize 'em, clean 'em, store 'em or sell 'em, and that's just tha apples! Ya gotta make sure that the tree's are healthy and safe from all manner of critter, and when ya have thousands of trees ta look after, it's a hard job. Then ya have ta take inta consideration all the animals we take care'f and we're borderin' tha Everfree so we gotta keep tha farm safe from those beasties too,"[/colour] Apple Bloom spoke her side, smiling as she stopped to look over at Purple, ignoring the silliness of Carrot as by this time she had gotten used to his general oddness around mares of any sort,[colour=#ff0000] "why, I'm shocked mah sis has a moment ta spare! "[/colour] she finished, grabbing the pole and straightening it out. As Carrot Fields blissfully listened, and watched, Applejack describe what she considered fun, he could help but notice what she was really saying wasn't so much that she enjoyed the chores themselves, but who she was sharing them with. In short, she enjoyed being with family, something he could really appreciate, even if family at this time only really meant his little sister, Purple Haze. What was equally endearing was the stunning mare classifying Carrot and his little sister as close enough friends to go out of the way to spend time with. He was happy to be Applejack's friend of course, even though he admitted, if only to himself, he wish he was a bit closer to the orange Apple mare than 'mere friendship'. Either way, this camping trip was a good step forward when it came to bonding and he was determined to make the most of it! Purple Haze let out an appreciative whistle. [colour=#8b4513]"Awrite, then! Oi'm a bampot, Oi guess! Haverin' on thinkin' yer doggin' it, roit? But ye're solid! "[/colour] She propped up the other pole, shoved the base of the pole into the hole in the bottom tarp, then started stretching out the ropes from the tent to pound more tent stakes in, pulling it up into a nice, tight shape while Apple Bloom kept it balanced. It wasn't a *perfectly* set-up tent, but she was rather proud of it all the same. Mac always enjoyed listening to his sister Applebloom getting passionate about the subject of the farm - it was their biggest family achievement, and the one thing that they would strive to keep running for as long as they were physically able to. the younger Apples young excitement and joy at talking about what the farmwork and the jobs that it entailed...many other ponies might have shirked or not wanted to bring such a topic with them, but AppleBloom was as passionate about her participations around the farm as AppleJack or indeed Mac himself...and such a thing always brought a small smile to the stoic stallions features. Whilst thinking on this, Mac becomes distracted from his thoughts when he hears his name mentioned in passing nearby - AppleJack was busy talking to Carrot about a previous incident...and once Macintosh got the idea of what his sister was talking about, he couldn't help but laugh a little internally...it made sense to him that she'd have done something like that, she was stubborn as a mule with a toothache when she wanted to be. Shortly after, the younger sister of Carrot Fields speaks up as she brings up the idea about going for a drink at the lake - he paused and looks around at the other two for a moment with a blink after she had finished her little query about them giving 'the tour'. " [colour=#b22222]Well, ah'm thinkin' it's somethin' we could, maybe, look into doin'... [/colour]"
Macintosh wasn't entirely sure if right now was a particularly good plan, given there was probably not a great amount of daylight left...but perhaps something could be worked out! Trying to piece together what Purple was saying was the sort of puzzle fit for a detective story with their high tech equipment and magic abilities rubbing metaphorical elbows with their sharp wits and cunning, well-educated and experienced minds. What the hay was a bampot? Apple Bloom could only piece together through context clues that it was sorta like calling yourself bad for disparaging something, and from there APple Bloom just sorta supposed that the rest of her speech was her greasing the wheels of friendship by being complimentary. That was fine enough to Apple Bloom! She liked being solid. Told her that she was the sort of pony that was fit to be an Apple, and there was little else that she could ask for besides being solid enough to be an Apple- and a cutie mark, but wishes were fishes and she felt like she was in the desert. [colour=#ff0000]"Well, Ah reckon that you and yer brother are solid too, Purple. Yer farm looks awfully sweet from Sweet Apple Acres!" [/colour]Apple Bloom complimented as she trotted side by side with Purple, who brought up the subject of drinking water and the lake nearby. Big Macintosh stepped in and did his big brother thing by offering it as an option, probably under supervision. Luckily for him he didn't have to worry his huge head about it because Apple Bloom was on the case and her middle name was reliability and safety. [colour=#ff0000]"Water's fine fo' drinkin', Purple. And Big Mac, Ah'll show Purple 'round, don'tcha fret. Nopony knows this lake like Ah do! Well, maybe you an' Applejack...but...uhhh, race you ta tha water!" [/colour]Apple Bloom quickly snapped her attention back to Purple, reared up, and started galloping towards the lake while giggling. Carrot Fields started to walk next to Applejack as they returned to the camp; he had a smile on his face but not the usual goofy grin when it came to mares he liked, but one of ease and camaraderie. Truth was he was still nervous, but not as much as usual and not as much in the past; it wasn’t that he liked Applejack any less, quite the opposite, but spending more time with her, and her family, allowed him to feel more and more as if he was a good friend. Even if she was a friend he had a huge crush on. [colour=#ff8c00]“Actually thare is yin thing ah aye wanted tae huv a go. Ah wish ah cuid be up in th' clouds lik' a pegasus. Ah know it's a silly thing tae bring up, bein' an earth pony 'n' a', 'n' it certainly haes nothin' tae dae wi' camping, bit it haes bin one of thae wee dreams o' mines, ah suppose it juist soonds silly 'n' foalish. "[/colour] Carrot wasn’t sure why he decided to reveal that particular fact to Applejack; it wasn’t nearly as serious and deep as the orange mare’s own statement about him and Purple being seem as so close to the Apple family, although he certainly liked the idea, nodding. Well nodding and blushing... Again. The ruddy maned earth stallion couldn’t help it though, and who knows, maybe Applejack will really like viewing the stars and hearing about them; they may bond even further, maybe he can even tell her how he really feels. Purple Haze blinked in surprise as Apple Bloom took off, taking just a moment to parse through the thick suthern of the Apple Family's odd drawl. Why did so many ponies have such an odd accent? They should all speak clearly, like the Carrots did! Still, a race was a race, and Apple Bloom had a head start! She let out a shriek of protest, reared up, and charged off after Apple Bloom, leaving Big Macintosh behind her. With a giggle and a laugh in her voice, she cried out,[colour=#ff8c00] "nae fair, ye cheater! "[/colour] Then her breath was used for running! She was a little bigger than Apple Bloom, and a bit faster, but Apple Bloom had gotten a good head start! She had just gotten caught up with Apple Bloom, almost to the lake itself, when she hit the muddy area surrounding it. Her hoof sunk into the gooey mud, throwing off her stride and making the lil' filly lose her footing. She tumbled flank over mane, falling right into Apple Bloom and sending the both of them rolling over and over to splash headlong into the shallow water surrounding the pond. Her head popped up above the surface a moment later, shot out a jet of water, and she started laughing helplessly. Macintosh watched as Applebloom and Purple got themselves off into what seemed to be a fun l'il race between 2 hyped up fillies - he chuckles to himself as he reminds himself of the days back when he and AJ used t'mess around in the mud piles around here themselves, when they used to frequent these parts themselves. It was nice to see the l'il apple making a new friend - even though she did have her loyal friends in the other two young'uns he'd seen her with from time to time, it was good that she was able to take time to make a new friend as well...and purple was most certainly the kinda filly that Applebloom could no doubt relate to. Well, since there wasn't much for him to get to doing, Macintosh simply made his way to his own tent and took some time to read a few books that he'd quietly obtained on his own. The red stallion was quite fond of Daring Doo's literary adventures, and had 'borrowed' some for his own amusement during such quiet moments in camp as these. Quiet for right now anyway...there was no real way for anypony to know for sure what lay ahead at this point. Apple Bloom couldn't help but let out a few impish giggles as she raced ahead of Purple Haze. Her new found friend let out a squeak of protest and followed Apple Bloom closely, but if Apple Bloom had learned anything regarding races it was that you didn't wanna touch Poison Joke! Her sister had told her that. But another lesson she just sorta picked up while racing her Crusaders was simply that anything goes when you're racing! [colour=#ff0000]"All's fair in lov'n racin'! "[/colour] Apple Bloom yelled back, glancing behind to see how big a lead she had on her fellow filly, finding to her dismay that the race was much closer than she would have liked! Apple Bloom double timed it, her smaller legs beating the path as quickly as she could make them. No matter what though, Purple kept on coming! Why, she was almost as fast as Scootaloo on the scooter. Well, that was a pretty big lie, but she was still really fast and as the lake approached Apple Bloom could feel Purple Haze pull within breathing distance. Suddenly, everything changed in a whirlwind of confusion. What was sure footing turned soggy then turned to air as her eyes caught visions of tumbling sky, ground, mud, water, and pony flying together in a crazy mix that Apple Bloom couldn't make heads or tails of. Or legs. Or mud. And as she went into the water, a frog. She was underneath the water for a few seconds, coming up with her eyes still rolling around her in her skull. They finally connected and gazed at Purple haze, just as she let out a jet of water that ended up right between Apple Bloom's eyes, forcing them shut. A moment later her eyes shot up with a bit of anger, but Purple started laughing and Apple Bloom quickly followed suit. [colour=#ff0000]"Well, Ah guess we tied! "[/colour] She laughed, splashing Purple mightily, then slowly splash/swimming/paddling/angrily attacking the water with all four legs deeper into the pond. [colour=#ff0000]"Mah...sister an'...I...go swimmin' all tha time when we camp'ere! And this water is safe fo' drinkin', too! "[/colour] To emphasize she dived down, took a gulp of untouched water, and burst back up with a lump in her throat, swallowing and giving a satisfied sigh. [colour=#000000]She walked over to the pile of supplies and pulled out a small barrel. She opened it up and pulled out a frying pan, a bag of oats, a bag of apples, a bowl of spinach leaves, a fruit pie, a six-pack of bottled apple juice, a box of graham cracks, some chocolate bars, and a bag of marshmallows. She laid these all out onto one of the many round logs that sat straight up, sitting idle since the last camping trip ponies took here. Carrot Fields was excited; sure he enjoyed camping, but what he really loved was canvasing the night sky, especially when he has ponies to share the experience with. Usually he would look at the stars alone as Purple Haze never showed any interest in the activity, and it was usually quite difficult to meet anyone else who was. This weekend though he had exactly the opportunity to share his foremost hobby; even if the others weren't particularly interested in the astronomical aspect, surely they would be entranced by the awe inspiring beauty of the colourful night canvas that his telescope would unveil to them in a whole new way. How could he not be excited? That is until he heard Applejack refer to him as "a dork". The ruddy maned stallion wanted to protest that assertion but all he could manage is to rub of the back of his mane with his hoof as he gave an awkward smile, [colour=#ff8c00]"eheh, umm yeah"[/colour]. The dejected stallion slowly walked up to the highest point near the camp site, a small hill that stood in the middle of an open clearing; it was the perfect place to set up his telescope. As good as the spot was, he excitement was gone, replaced by a morose feeling. Suddenly what was his favorite pastime felt like a display of his pronounced "uncoolness" in the eyes of the mares. Did he just talk to himself out loud? What a dork. Purple paddled readily, laughing merrily as she floated in the pond. She followed Apple Bloom's example, taking a drink of water, then splashing back at her. She finally retreated before the splashing, paddling further over to the side of the pond, into a tall sprouting of reeds. She liked how they tickled over her sides. She glanced over to where Applejack and Carrot were walking through the forest. She'd never had a very special somepony of her own ... she wondered what it was like. The chatter around the camp fire was growing ever more casual, but still very energised - Macintosh couldn't help but chuckle a little at how everypony had all fallen into a l'il relaxed niche.....the girls were over yonder playing and talkin' about whatever it was fillies discussed amongst themselves, and AJ was starting a campfire as her conversation with Carrot haze continued in whatever direction it was heading. A slow smile crept onto the red stallions features as he took a moment to observe his surroundings, relatively assured that the entire weeekend wasn't liable to erupt in flames at any one moment, or that some unknown disaster wasn't going to engulf their respective moment of reflection. As he took a second to finish up the page he was on, Mac realised he was gettin' a mite hungry - well, the soft growls from his stomach more brought this to his attention than anything else possibly could, and Mac chuckled to himself at the realisation that he really hadn't had a whole lot to eat in the last 12 hours. AJ's setting up for a campfire noshout was not lost on the Red apple stallion, since this meant his stomach was gonna be quite content with things once he had the opportunity to sit down and get his hooves stuck into some good ol' campfoods...it really was only a matter of time now afterall. Still, he was aware of the fact that AJ was still talking to carrot for the time being and hadn't called the rest of the group over - as close as it might have been for the groups dinnertime, mac knew better than to come over before everything was good an' ready, since AJ was fond of calling folks over for meals rather than just letting them amble over on their own whims. His eyes return momentarily to the pages of Daring Doo and the Adventure of the Golden Hornet...one of the few Daring Doo books that he didn't currently own. t'was an enjoyable romp so far, and he had found it most definitely to his own liking so far - as a result, Mac simply wasn't in a big hurry to head over just now anyway...preferring to just lazily engage himself in the act of quietly scanning and reading the book from cover to cover until such a time that he and the gals were called over for big ol' family campfire eats! Eeeeeeyup, moments like these were just what camping trips like this were all about and he was pretty grateful just to be able to sit back and see it all come together. Apple Bloom was more than happy and content to float in the pond and splash playfully once in a while until they were called back to land by their older siblings. It was how such filly friendships were made when you were young, especially from older ponies who generally ruined all the fun by telling you to stay away from the deep water or not to play with the water spiders that swam on the surface. Well, she thought they were awfully pretty and phooey to the old mare's tale that said they carried deadly poisons. It certainly ruined one or two secret young Apple Bloom bug hunts. As she sat there contemplating the best way to catch a water spider, she was ambushed by a question. It took her less than a moment to think of it as she drew closer to the weeds, ambushing Purple with a mighty splash before answering. [colour=#ff0000]"Do Ah have a coltfriend? Nah, can't say Ah do. Ah might have a fillyfriend though, Winter Dazzle. Ah dunno, maybe Sweetie Belle? Or Scootaloo? Ah mean, not sure whatcha have ta mean ta be a special somepony. They're all special someponies to me,"[/colour] She nodded, satisfied with that answer. She then looked over to her family. Applejack was making a fire using her great Apple family wisdom, and Big Mac was reading a book. Yep, everything was normal over there. Did they have special someponies? Huh. Well, maybe? Probably not.